It’s time for our biggest party of the season! Latino Network invites you to Primavera Social - a celebration filled with music, dancing and amazing food. We'll have an exciting poker tournament hosted by The Party Team for participants to win incredible prize packages while supporting our organization! Savory bites will be provided by Vibrant Table to be paired with wine, beer or one of our specialty spring cocktails. And be ready to dance the night away with music by Tequila Highway. We would like to personally invite you to Latino Network's Annual Holiday Open House! The holidays are a time to reflect on this past year and celebrate with friends, family and community. Thanks to you, our programs have engaged more Latinx youth, families and communities than ever before, and we want you to celebrate this amazing accomplishment with us. Join us on Friday, December 7th at our Portland Office from 5-8pm! There will be light food and drinks, good music and even better company. We encourage you to RSVP through this link in order for us to get an accurate attendance estimate for food and drinks. Latino Network presents VOZ ALTA: Generaciones, a dramatization of the lives of Latino artists Rodolfo Serna and Jesus Torralba. This presentation is an intimate view into the formative experiences that shaped Rodolfo and Jesus as artists and youth mentors. Both in search of a home and a place in the world, they each turned to the arts for personal healing, self-discovery, and creative expression. Today, Rodolfo and Jesus give back to the community by working with at-risk and gang involved youth in Multnomah and Washington County through the Community Healing Initiative (CHI). This show highlights their personal challenges, successes, and their mentor/mentee relationship. VOZ ALTA is a storytelling project that features the personal lives of Portland’s Latino community through interwoven narrative and live music. This bicultural production features narratives written in English with songs performed in Spanish. Directed by Michael Cavazos (Writer/Arts Producer). Written by Joaquin Lopez (Arts & Culture, Latino Network) and Cynthia Gomez (Executive Director, Cultural Resource Centers, MFA Candidate Creative Nonfiction, Portland State University). Music by Gerardo Calderon. Voz Alta is supported in part by the Multnomah County Cultural Coalition, The Collins Foundation, The Miller Foundation, in honor of Latinx Pride 2018. Recommended for ages 13 and up for hard language and adult content. Join us for our Day of Action where we come together with partners to commit to voting NO on Measure 105, an extremely racist ballot measure that will attack our community. We will have speakers, provide trainings, volunteering opportunities, and much more. Refreshments will be provided. ¡Festival Latino and Soccer Tournament! Bring your family and friends to a special screening of Coco (2017) PG in Spanish with English subtitles in Thomas Cully Park on Saturday, August 11 at 4:00 PM. Pre-movie entertainment will be provided by Colectivo Son Jarocho de Portland —deep Afro-Mexican roots. Pre-movie entertainment starts at 7:30 PM. Movie begins after dusk. Bring blankets or low-back chairs to sit on. Pack a picnic or try some of the tasty dishes from our onsite vendors. - Alcoholic beverages for personal consumption are permitted only during concerts and movies. - All parks and natural areas are smoke, vape, and tobacco free zones. Before the Movie: Play in the Latino Network Soccer Tournament! It’s time to play soccer! Please join us for our sixth annual soccer tournament Saturday August 11, 2018 from 4:00pm-6:00pm at Cully Park located on 5810 NE 72nd Ave, Portland, OR 97220. Teams must be coed and participants must be 11 years of age or older to play but the whole family is welcome to cheer and enjoy the action! ¡Es hora de jugar fútbol! Por favor acompáñenos para el sexto torneo anual de fútbol el sábado 11 de Agosto del 2018 de las 4:00pm a las 6:00pm en el parque Cully Park ubicado en 5810 NE 72nd Ave, Portland, OR 97220. Los equipos deben ser unisex y los participantes deben tener 11 años de edad o más para jugar pero toda la familia está invitada para apoyar y disfrutar de la acción! Join us as we celebrate our amazing volunteers! Released in 2002, Frida is a dramatic retelling of artist Frida Kahlo’s private and professional life as an internationally renowned surrealist artist. Set on a global stage in the early 20th century, the movie chronicles Frida’s challenges with her health, sexuality, career and fame. Frida must struggle to maintain her complex identity and individuality amongst a dysfunctional relationship with fellow artist, Diego Rivera. 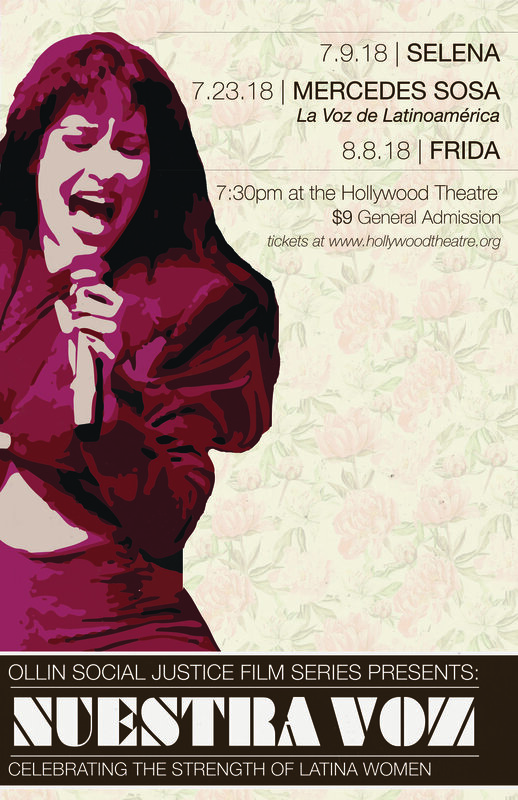 Directed by Julie Taymor, the film stars Selma Hayeck, in an academy award winning performance, as Frida. Director Rodrigo H. Vila’s 2013 film is a documentary chronicling the life and influence of Argentine singer Mercedes Sosa. Drawing upon a rich background of Argentine folk music, Sosa was one of the primary artists to give rise to “nueva canción,” a social movement and musical genre which gave voice and empowered many people across Latin America. Together with her family, Sosa toured with world in the 60s and 70s performing her music. Despite her international success, Sosa was exiled from Argentina by a hostile military dictatorship. Heralded as the "voice of the voiceless ones," Sosa successfully produced over four decades of work which still inspire causes today. Directed by Rodrigo H. Vila, the film features Chico Buarque, Elba Bustelo, and David Byrne. Proceeds go towards Latino Network's advocacy programs. For an afternoon full of music, traditional dance, and food. Latino Network’s very own Corazones Alegres youth dancers will perform dances native to different regions of Mexico! This event will benefit Latino Network's Arts & Culture Programs. JOIN US IN CELEBRATING PORTLAND PRIDE! On Sunday, June 17th from 10am-3pm Latino Network will be participating in the Portland Pride Parade! You are invited to walk with us as we join our fellow Latinx and LGBTQ+ communities to support equality for all! This year, we have a truck, music, traditional folk dancers, and so much more! Light refreshments, pan dulce and snacks will be available. It’s going to be a party, so bring your family and friends for this amazing event! Pride Parade will begin at the North Park Blocks. We will walk through China Town, then head south on Naito and end at Tom McCall Waterfront Park. As the event nears, we will keep you informed with the exact location of our gathering. On behalf of Latino Network, we hope you can join us as we celebrate diversity and equality for all! Latino Network is devoted to Latino artists who honor tradition, build community trust, push boundaries, and invite us to discover new landscapes and forms. We invite you to join us for this inaugural nonprofit gallery project - the opening reception is FREE and will take place in our office! This is the first time we'll showcase a Latinx artist's work in our workplace. We are excited to invite the community to celebrate with us. What's more, 30% of the profits from the art will go toward our youth programs! Alejandro plays with color like children play with joy and laughter. Colors pop into frame. His textures and shapes speak a language that is bold, fresh and new, yet familiar and comforting. Above all, his work is personal. Alejandro reminds us we have the power within to reshape and reframe every part of ourselves. While Rome Burns: An Event to Benefit Latino Network at Mississippi Pizza! While Rome Burns celebrates it’s one-year anniversary with PDX Latin-funk favorites Sabroso and indigenous dance group Huehca Omeyocan, all to support our programs! This one will be a super-fun, super-dancey affair – so bring the kids, bring a hankering for pizza, ad bring appropriate footwear. For more info and to sign up for the email list, visit their website! Want to be more involved and volunteer through our programs? Join us on Wednesday April 18th to learn how you can help our community! We'll have volunteer sign-ups, information about future opportunities, and general information about our volunteer practices and how you can help out. EMAIL OUR VOLUNTEER SPECIALIST JUSTINA FOR MORE INFORMATION! Join Central Northeast Neighbors, Latino Network and the City of Portland’s Bureau of Planning and Sustainability, for a conversation about how climate change affects our local communities. Interpretation, Childcare and Food will be provided. For more information about the conference, please contact Ana Muñoz. Join us for our annual Poker Tournament to benefit Latino Network! An evening of food, fun, poker, and prizes - all for a great cause! So, open up your wallet, put on your game face, and get ready for an unforgettable evening! 21+ event. All levels of poker players welcome! This is a tournament for charity, so come have fun and win some prizes. Also a special thanks to IBEW 48 for sponsoring this fun night, and to Gather for donating the event space! Includes 4 raffle tickets. For $100 buy-in, you will have a seat reserved in the poker tournament to play for prizes! You start off with $2,500 in chips to play (opportunities to purchase more for $50 during the tournament) PLUS 4 raffle tickets to enter to win awesome prizes. You'll also enjoy delicious hors d’oeuvres as complimentary wine and beer during the tournament. $50 rebuy during the tournament, which includes 2 raffle tickets. Don't play poker? Don't miss out! You don't need to play to win! Come join us for an evening of food, wine & beer, and música. While others play poker, you can mingle with friends, eat and drink, and enter to win awesome raffle prizes! Ticket comes with complimentary food and drinks as well as 1 raffle ticket (you can purchase more at the event through our Spin The Lat Net Wheel Game!). 6:00 pm - Doors Open. Registration & Check-In. Food & Drink available. Haven't played poker in a while? Not sure what a big blind is? Come early and brush up on your skills. 7:00 pm - Poker Tournament Begins! Our poker gamemaster will lead us through tournament play. If you get out early, you'll have the chance to buy back in for $50. Winners of each round will earn more raffle tickets to win cool prizes. The overall winner will earn even more raffle tickets, increasing the chance you'll win those Alaska Airlines tickets! Raffle tickets can be won and purchased throughout the night! We’ll have our “Lat Net Wheel of Fortune” that you can spin for $10 to win more tickets. Raffle prizes will be drawn once poker play is completed. At the end of the tournament, raffle winners will be drawn for the grand prizes - need not be present to win. Join us on Wednesday Feb. 7 to learn how you can help our community! It's time to GIVE BIG during the holidays! We're participating in Willamette Week's Give!Guide - the city's largest holiday fundraiser that helps connect the community to nonprofits who are doing work that makes a difference. We're asking YOU - our familia - to help us give big this year. With fun Big Give Days that have amazing prizes, and your choice of 149 nonprofits to give to, we can't think of a better way to give back and end 2017 on a positive note. Spread the word to your friends and family about this statewide movement to help nonprofits give back to their communities. Help us positively transform families, youth, and communities this holiday season. Give to Latino Network during Give!Guide 2017! Please join us for Hispanic Heritage Celebration Night when the Trail Blazers take on the Los Angeles Clippers on October 26th at the Moda Center! We are proud to host a festive evening celebrating Hispanic Heritage Month at this exciting inaugural event benefiting our organization. Click on ‘find tickets’ to select the seats you would like and enter your promo code (HHN) to access the group pricing. A portion of every ticket sold will go directly to our fundraising efforts! Get your ticket today and join us in the Rose Room for a pre-game social with live entertainment. A special commemorative gift will be given to you upon entering the event! Voz Atla: Amor en los tiempos de guerra/Love in the Time of War presents an intimate dramatization of the lives of Anabertha Alvarado (Early Childhood Coordinator) and Dawn Joella Jackson (Principal at Helensview High School). Actors and musicians will perform their lived experiences, achievements, and personal endurance through the power of story, live music, and the music of words--poetry. This dramatization that interweaves storytelling and music is written by Latino Network staff Santos Herrera and Joaquin Lopez. Guest director is Rebecca Martinez from Sojourn Theatre. Music director is Gerardo Calderon. Art Design is by former Latino Network staffer Rolando Avila with our Graphic Design and Communication Specialist Katelyn Henson. Anabertha Alvarado - Community Education Worker Coordinator for Juntos Aprendemos (Early Childhood). From an early age she learned the power of nurture, the depth of isolation, and the resilience of migration. Beating to her own drum, she knew she was different and learned to be proud of it! Enduring the loss of hope, she survived the debilitation of el pueblo chico e infierno grande to create a life filled with love and honor. Dawn Joella Jackson - Principal at Helensview High School. Raised by her father, a hippy, Jewish musician, and a strong determined Latina mother, Dawn learned the strength of going with the flow and self-determination. Her New Mexico roots taught her there is nothing stronger than family and more powerful than a girls kiss! Raising two boys of color with her partner, Dawn’s story is a testament that love indeed does endure in a time of war. Voz Alta returns to where it was first presented--Milagro! This year Latino Network is featuring a gallery in the Maya cafe and lobby of art created by Latino Network youth mentored by Rudy Rolon, Jesus Torralba, and Rodolfo Cerna. Check us out! Voz Alta is supported in part by the Regional Arts and Culture Council, Multnomah County Cultural Coalition, and PDXLatinXPride. Join us for a night of friends, family & food! Latino Network's very own Corazones Alegres youth dancers will perform ballet folklórico from different regions of Mexico! Join The Board of Directors at Latino Network for the annual Cinco de Mayo Poker Tournament! 6:00 - Let the games begin! Dinner, beer and wine, and raffle prizes included with your ticket! Join us for the third and final Ollin Film at The Historic Hollywood Theatre! Released in 1983, El Norte follows two indigenous youth who are forced to travel to America due to the repercussions of Guatemala’s brutal civil war. The film’s protagonists, Rosa and Enrique Xuncax, experience material and spiritual losses while on a journey north towards the fabled U.S.A.
Serena Cruz, Executive Director at Virginia Garcia Memorial Foundation, will be in attendance for a post-film discussion on the film’s social justice themes. Want to eat some good pizza for a good cause? Join us at Mississippi Pizza on Thursday, March 30 for a fun night full of good food and music! All proceeds benefit Latino Network! $10 cover charge - all proceeds benefit Latino Network's Immigrant Action Fund!